Samsung’s Galaxy S10 lineup of phones is perhaps the most expansive and extensive line of devices to share the same basic name. There are a total of four different devices bearing the S10 badge: the Galaxy S10, Galaxy S10 Plus, Galaxy S10E, and the yet-to-be-released Galaxy S10 5G. If you’ve got your mind set (and your wallet open) to buy an S10 model, it can be daunting to figure out which one is right for you. I’ve already reviewed the Galaxy S10 Plus in depth, and we’ll have another piece on the Galaxy S10E very soon. For this article, I looked at the standard Galaxy S10 to see how it’s different from the Plus model, and the few differences should be self-evident to most observers. 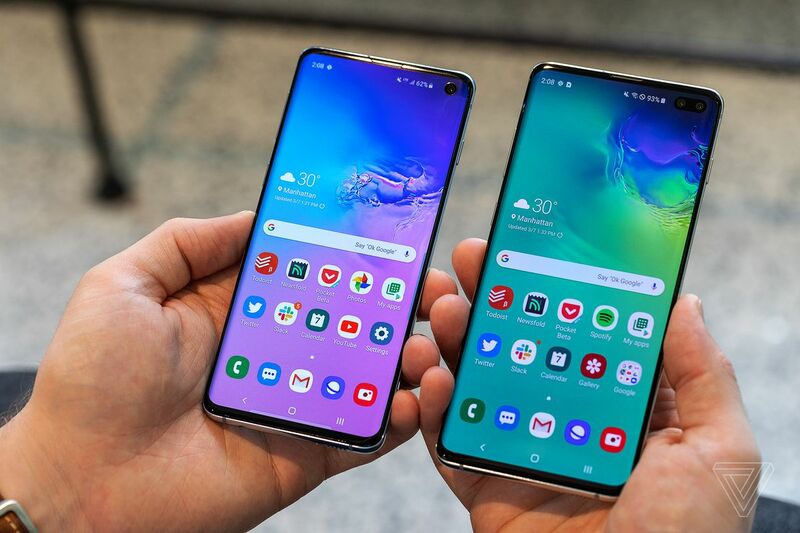 The most obvious difference between the Galaxy S10 and the S10 Plus is the physical size: the S10 is smaller than the oversized S10 Plus. Both models are about the same thickness, but the S10 is roughly 4 millimeters narrower and about 8 millimeters shorter than the S10 Plus. As a result, I found the S10 to be much easier to handle in my day-to-day life. It fit in my pockets easier, it was less likely to fall out of my hands while I used it, and I could even do some things with one hand, thanks to Samsung’s new software design. The power button and volume keys are still mounted awkwardly high on the sides of the phone, but they are slightly easier to use on the S10. Don’t get me wrong: the standard S10 is still a big phone, and if you really want a smaller device, you’ll probably be happier with the S10E. But the S10 is more manageable than the S10 Plus, and I didn’t feel the need to add a PopSocket or other modification to make it easier to handle like I did with the bigger phone. Thanks to the latest Qualcomm Snapdragon processor and plenty of RAM, the S10 performs just as flawlessly as the S10 Plus. There doesn’t seem to be anything I can do in my daily workflow to slow this phone down. Apps open smoothly and effortlessly, scrolling within apps is the smoothest experience I’ve ever had on an Android phone, and the large amount of RAM lets me multitask and hop between apps without skipping a beat. 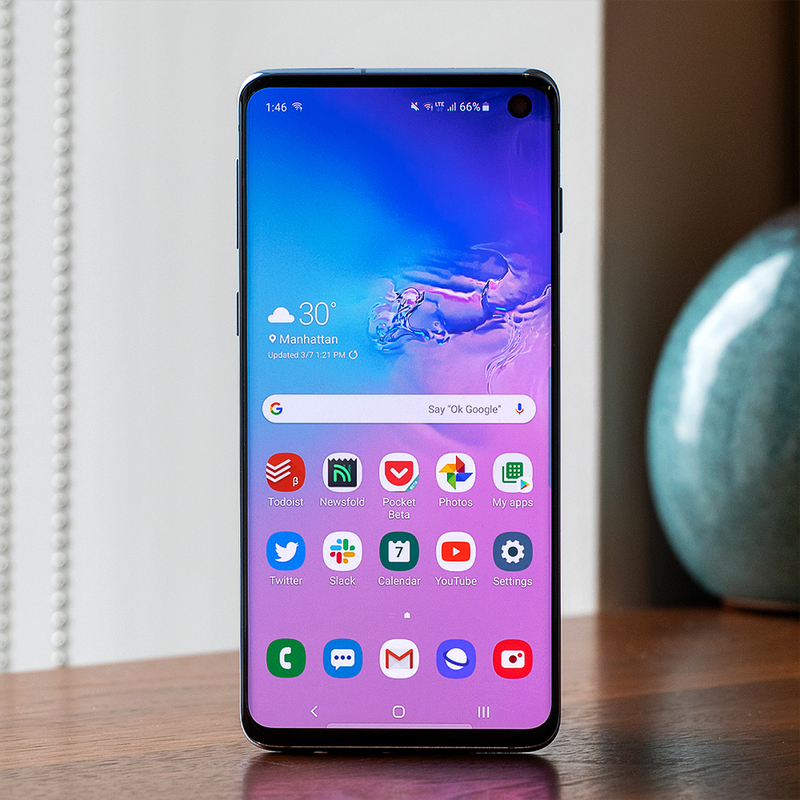 I was thoroughly impressed with the performance of the S10 Plus, and I had the exact same experience with the standard S10. The most noticeable difference in everyday use between the S10 and the S10 Plus is battery life. The S10’s smaller size means it has a roughly 17 percent smaller battery than the S10 Plus (3,400mAh compared to 4,100mAh). As a result, it does not last as long between charges as the S10 Plus. In my testing, I’ve been able to use it for an entire day between charges without issue, even when using it heavily. But it doesn’t easily reach the two-day mark with light use, which the S10 Plus can do with aplomb. That isn’t to say the S10’s battery life is bad. In fact, I think it’s just fine, and I don’t have any issues with it. But if you’re looking for the most battery life, the S10 Plus is what you should get. Like many other hardware features, the S10 has the same fast wired and wireless charging features as the S10 Plus as well as the ability to wirelessly charge other devices, such as wireless headphones or smartwatches. The last difference between the S10 and the S10 Plus is found in the camera systems. The rear cameras are exactly the same: they have three different lenses available for standard, telephoto, and ultrawide compositions. The difference is on the front, where the S10 has just a single lens instead of the dual-camera lenses of the S10 Plus. Both have the same camera for capturing images and video, but the S10 Plus has a secondary image sensor that’s used for depth mapping and portrait effects. In practical use, however, there really isn’t a difference that I was able to determine between the two. The standard S10 still has the same kinds of portrait mode effects as the S10 Plus, and there isn’t an appreciable variance in quality between the two phones when you view them at normal distances. 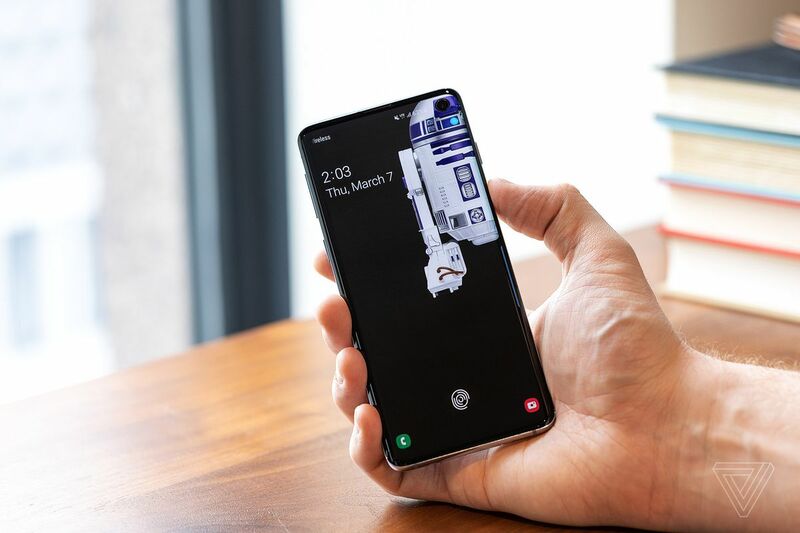 I did appreciate the fact that the S10’s single lens hole-punch takes up less screen real estate than the dual-lens cutout of the S10 Plus, which allowed me to use a fun R2-D2 wallpaper. Overall, the S10 is nearly as impressive as the S10 Plus. In fact, the two are almost identical in all performance metrics aside from battery life. The S10’s smaller frame is also easier to handle than the S10 Plus’ girth. They even have the same software experience and features, including the indeterminate wait for updates that plagues all Samsung phones. 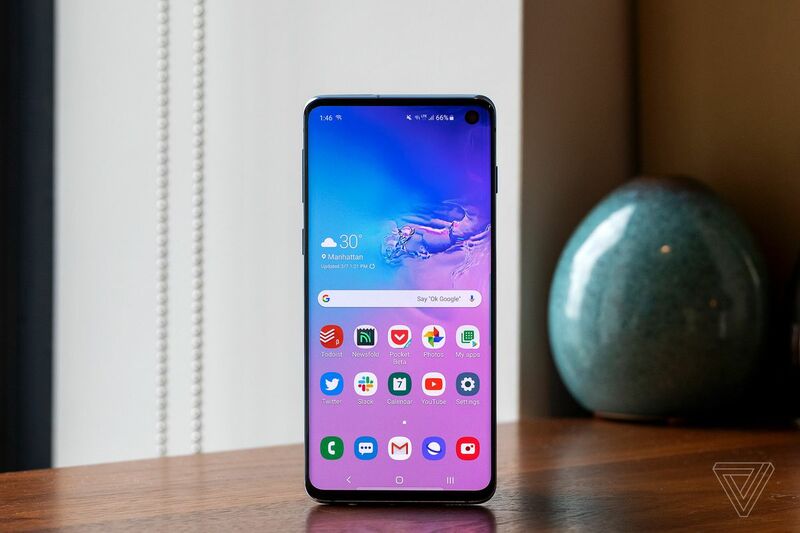 But the S10 is only $100 cheaper than the S10 Plus and $150 more expensive than the S10E, which offers much of the same experience in an even smaller size and without the annoyances of the in-display fingerprint scanner. I think the S10 Plus’ extra cost will be worth it for those who want the absolute best battery life they can get, while the S10E will be more appealing to people who are looking for a smaller phone or wanting to save some money. That leaves the standard S10 in a sort of weird middle ground where it doesn’t really stand out or excel at anything. At full price, it’s hard to recommend the regular S10 over the other two models. But since Samsung phones typically fall in price and see significant promotions just a couple of months after release, the S10 could be an appealing option with the right deal. 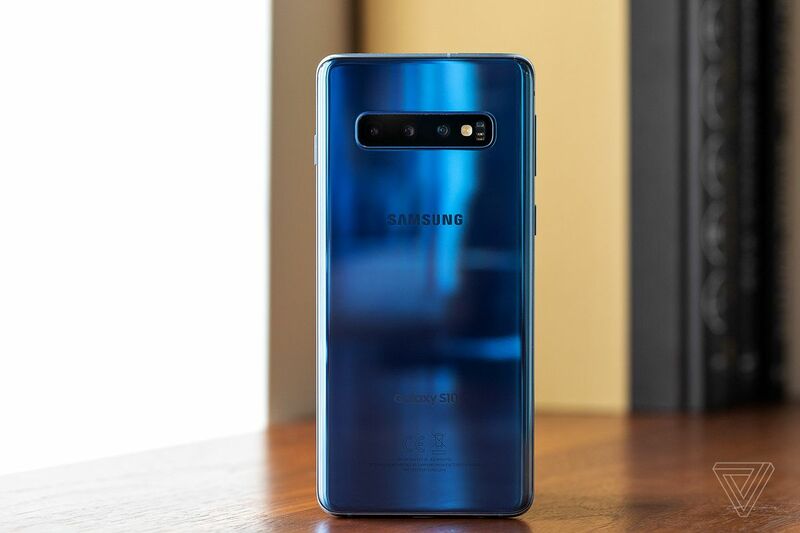 For now, though, my recommendation is to either go all the way with the S10 Plus or save some money and go with the S10E. We will have another article on the Galaxy S10E very soon, so be sure to look out for that to learn all of that phone’s unique characteristics and features. This Review has a component height of 32. The sidebar size is long.